Looking for a change in the snack routine? Tired of your kids asking for “sweets” that you don’t want to give them? Need some REAL FOOD for dessert? 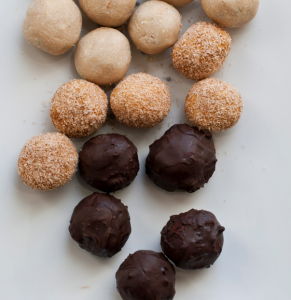 Try these FUN protein ball and bite recipes that your kids can help you make!! Blueberry Vanilla – You can use whatever vanilla flavored protein powder you have on hand. I like pea protein powders and always avoid soy protein powders. For an extra protein boost, add a scoop of Vital Proteins Collagen Peptides from Thrive Market. Switch agave to honey and decrease to 1 tbsp for less sugar. You can sweeten more with Stevia drops if desired. Cake Batter Balls– can use protein powder instead of coconut flour. Nut Butter Crisps– be sure to get a gluten free rice cereal if you eat gluten free. Last I checked, Kellogg’s Rice Krispies has Barley Malt which is not gluten free. Substitute almond, cashew, or sunbutter if you need a peanut free version. Use Sunbutter (sunflower seeds) for a nut free version and decrease the honey to taste since Sunbutter is usually sweetened.